SOS Greyhounds - Site de europe4strays ! Greyhound racing is an organized, competitive industry in which greyhound dogs are raced around a track. There are two forms of greyhound racing, track racing (normally around an oval track) and coursing. In many countries, greyhound racing is purely amateur and for enjoyment. In other countries (particularly Australia, Ireland, Macau, Mexico, Spain, the UK and the US), greyhound racing is part of the gambling industry, similar to although far less profitable than horse racing. Today, the cruelty of the industry is finally being exposed! British charities rehome many surplus dogs, but thousands are unaccounted for each year. Some are abandoned, some killed crudely, others sold for dissection. Exportation for racing in Macau (China) if the dog does not place in the first three it will be destroyed or they are also sold into the illegal meat trade. Europe4strays joins its voice and takes part to the International protest to ban this cruel racing industry and to stop the exportation of these gentle souls to a tragic death in China! Please take action, you will find here below the links to the Petitions to sign and to the events to attend. 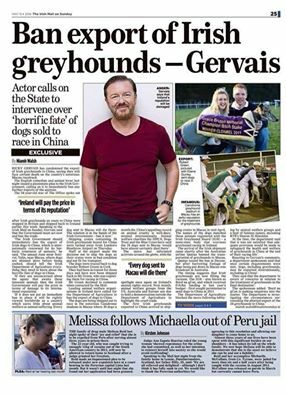 The english actor Ricky Gervais speaks on behalf of the Irish Greyhounds sold to race in China. 1. Contact Lufthansa airline who have not stopped flying greyhounds from Ireland to China and ask them to introduce a policy of not sending any racing greyhounds to China ever. The more people at Lufthansa we contact and make them aware of this issue, the more likely they are to take notice. *Sign the petition to Lufthansa to stop greyhounds being sent. 2. 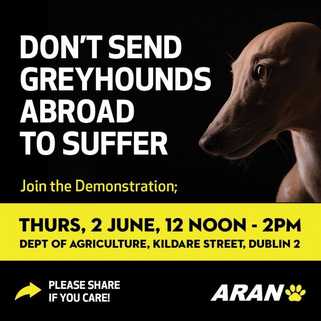 Send an email to the Irish Minister for Agriculture, Michael Creed, urging him to introduce a ban on exporting greyhound to China. He is the new Minister appointed on 6th May. Follow CAGED Northwest on Facebook for updates on the 24 greyhounds sold to China to race in Macau canidrome. On may 12th UK activists at Manchester airport were able to block the shipping of the dogs on a Lufthansa cargo flight to Hong Kong via Frankfurt.